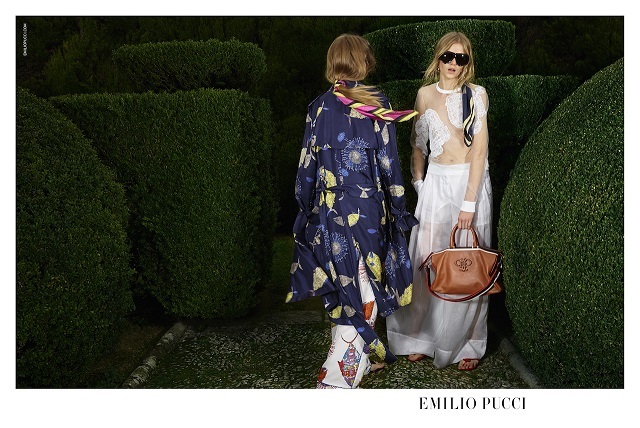 EMILIO PUCCI SS2016 Ad Campaign EMILIO under the Creative Direction of Massimo Giorgetti. Rooted in Pucci’s storied past, yet springing forth with a pulsing energy, the new images are the latest vision in Giorgetti’s bold recalibration for the storied Florentine label. The mood and look follow Giorgetti’s new rule breaking dictate. The images are lofty yet fueled by the speedy, impulsive sting of the street.Set on the gran grounds of Villa Gamberaia, a splendid Renaissance palazzo hidden in the hills outside of Florence, the campaign followsa Giorgetti’s fascination with Pucci’s aristocratic heart. But beneath the decadent surface lies a new underground energy and a renegade spirit that leads to cool fashion content for a new generation. “We’ve been building this new mood for the brand since we shot two models in T- shirts on the top of the roof of Palazzo Pucci in Florence,” Giorgetti says, citing the teaser images that preceded his Pilot collection in June 2015. “Pucci’s sophisticated past is always present, but it’s twisted and tweaked. The pieces are all very high end, but the attitude is easy and cool. These are bon ton girls who run around with undone hair.” Models Odette Pavlova and Kadri Vahersalu represent classic beauties who are loosened from conventions, unburdened by propriety. They run, they laugh, they play at whim. Their clothes are thrown on, layered in a spontaneous, unscripted way that is borrowed from an urban setting. The images, as well as three short videos filmed on location at Villa Gamberaia, are shot by Ezra Petronio, founder of Self Service magazine. The campaign was styled by Massimo Giorgetti. Hair is by Akki and make up by Karim Rahman.